A finger or toe injured in a car door or jammed against a hard object is a common injury in children. If this happens to your child, he/she should be seen by a healthcare provider to assess the injury. For older children, injuries that only involve the end segment of the finger or toe and not a deep or bad cut, can often be treated at home. Minor breaks of the bone in the tip of the finger or toe are often left untreated. However, some breaks may need to be splinted. 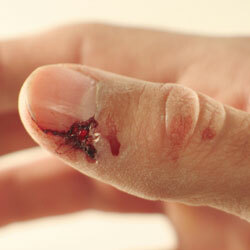 Blood often pools under the nail of the injured finger or toe, causing severe throbbing pain. A doctor can relieve this pressure by draining the blue-black blood you can see through the nail. Often the nail is partly pulled off during the incident. Do not pull it off. See your doctor, who may be able to fix it. There are several steps you can take to relieve pain and speed healing for your child’s injured finger, toe or torn nail. If your child can move his/her finger or toe easily and the injury does not involve the nail bed, apply an ice pack to reduce swelling. Also use acetaminophen or a similar over-the-counter pain reliever. If the finger or toe is bleeding, apply pressure on the wound and elevate above the heart until bleeding stops. Wash the wound with soap and water, and watch for any signs of infection, such as redness and swelling. If a bone fracture is suspected or the injured finger or toe involves a deep or serious cut, seek medical attention right away. Clip carefully along the line of the tear. Soak nail for 20 minutes in cold water to reduce swelling. Apply antibiotic ointment and cover with non-stick sterile dressing to keep clean. On second and third days, cover loosely with an adhesive bandage, use antibiotic ointment, and continue to soak. On fourth through sixth days, soak daily in warm salt water (1/4 teaspoon in 8 ounces of water) and apply antibiotic ointment. Cover with non-stick sterile dressing to keep clean. On seventh day, stop the soaking and dressing. New skin should have formed.